Bladder prolapse is particularly common in women over 50 years of age. It’s treated through an operational lifting of the bladder, with the use of a special implant – a polypropylene net. In some cases it happens that one of the arms of the net grows into the wall or the inside of the bladder, causing medical problems – pain in the lower abdomen, bladder infection, pollakiuria, etc. - Until recently, we removed the foreign body out of the bladder through an operation, consisting in the laceration of the abdomen and the bladder, the removal of the body, and the suture of the bladder and the abdominal walls. All this took at least an hour and required a prolonged general anesthesia of the patient, who then had to stay in hospital for another 4 days for healing of the wound and monitoring for possible complications. All this time, the patient had to carry a bladder catheter – explains prof. Marcin Jóźwik, head of the Gynecology and Obstetrics Clinic and Department of the UWM Medical School. In September 2017, a 59-year-old patient named Iwona sought medical attention of prof. Jóźwik, due to her bladder discomfort. She had earlier undergone a bladder operation with the use of the polypropylene net. The examination confirmed that an element of the net had grown into the bladder. This time, however, prof. Jóźwik suggested to the patient that the foreign body be removed not in a traditional manner, the laceration of the abdomen and the bladder, but by way of a minimally invasive endoscopy. This method also requires that the patient be under a short term general anesthesia. Upon administering the anesthesia, the surgeons filled her bladder with water, to make it hard. 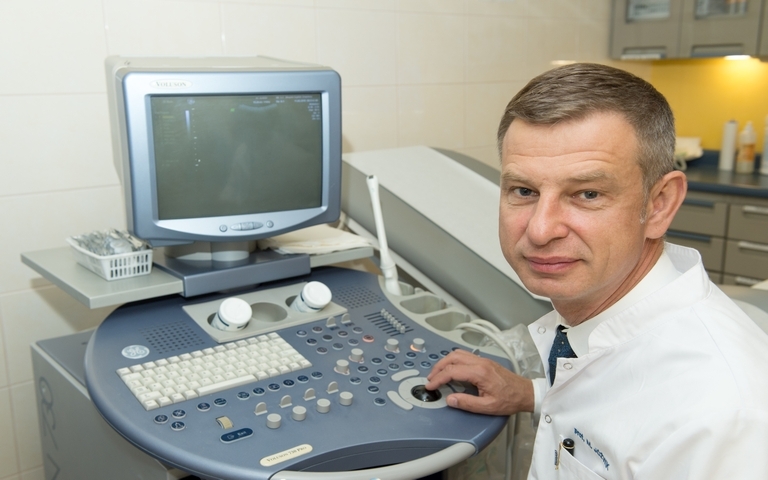 This enabled prof. Jóźwik to enter a 5-milimiter endoscopic camera into the bladder through the abdominal wall. Subsequently, two endoscopic devices were entered into the patient’s bladder. When the devices were mounted inside, the doctors let the water out of the bladder and pumped it with air. This, in turn, was done to “allow me see everything with the camera. The image generated in water is blurred,” explains prof. Jóźwik. The part of the implant that had got stuck in the bladder was then cut off by the professor and removed through the urethra by his assistants. - The openings in the abdomen and the bladder are so small that they do need to be sutured. We could have sent the patient home right after she woke up from the anesthesia, but we left her for another day in hospital to be sure. Several months have passed since then and we have no information of any problems or complications. Everything went as planned – says prof. Jóźwik. The method is innovative not only for being minimally invasive: the procedure can be performed with regular tools, without the need for special disposable tools. It’s not only the patients who benefit from the new method, but hospitals as well, as it is less expensive and not as time-consuming. Prof. Jóźwik endeavors to popularize his new method. Prof. Marcin Jóźwik performed the innovative procedure of removing a foreign body from the bladder without its laceration in September 2017. He was assisted by a team of doctors: Bogdan Krasucki, Maciej Żukowski, Natalia Góralska and Krzysztof Jabłoński. For designing and implementing the method, he was awarded “The Best of the Best” – the highest regional distinction granted by the Marshal of the Province of Warmia-Mazury.